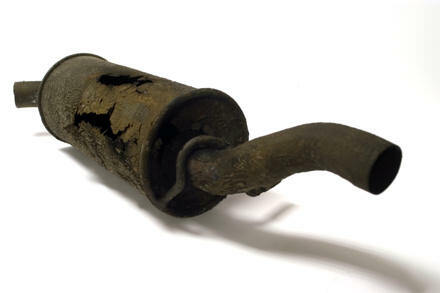 Yesterday morning I climbed into my car (a silver Vauxhall Astra 1.4, thanks for asking), switched on the engine and was met with a wall of sound chugging its way out of the back of my newly-broken exhaust. Darn! 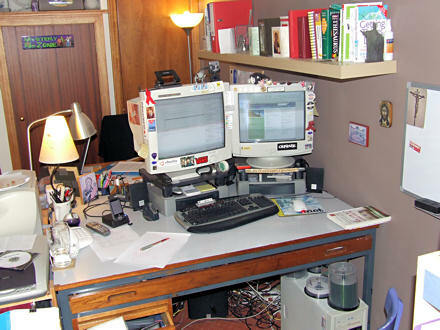 Well, okay, that’s a photo of where I work from at home. That’s certainly one benefit of managing the new University website within a content management system (TerminalFour Site Manager, thanks for asking). This allows me to login from any browser (well, okay from either IE or Mozilla Firefox) and get on with creating, editing and publishing content, as well as managing the design. It’s been a funny week. On Tuesday I felt as though I came out from under the desk. “Is the coast clear?” I asked as I popped my head above the parapet. To say that there was “some feedback” after the site went live last week would be an understatement. But to be fair it could have been a lot worse, we only had to deal with about 150 support calls and on the whole the feedback has been generally very positive. These have been calls from people who can’t information because it’s moved — this is understandable, almost everything is in a new location now — we’ve been able to direct them to the new location. This is content that either didn’t get migrated from the old websites, or did get migrated but the links haven’t been setup yet or for some reason the content didn’t get published to the server. We’ve been able to prioritize these and restore the most important links and content as required. Why is that link/content there?! It’s five years out of date! One of the things that we said about the new site architecture is that it would ‘level the playing field’, making everything much easier to find and less likely to be hidden within a labyrinth of clicks. Almost all the content was simply copied over from the old sites, but now it’s easier to find information it’s now also easier to see what is out of date. These have been some of my favourite calls to fix, partly because they are so easy, and partly because the originating calls can sound so pedantic. My favourite so far has been a call to fix four apostrophes on one particular page. I found the page, clicked “Edit”, logged in, made the fix, sent it to publish: job’s a good ‘un! Next! So it’s been quite nice to work from home today. I felt pretty exhausted, my car got a pretty new exhaust, and I was able to listen to some searing metal on my 6.1 surround sound PC system, which I couldn’t have done in the office. However, six hours and £90 later my car is fixed and come Monday morning it will be business as usual in the office. Hoorah!